Here is the day by day travelogue. Some days are omitted because nothing really big happened. Hey, some days you need to just kick back and relax. 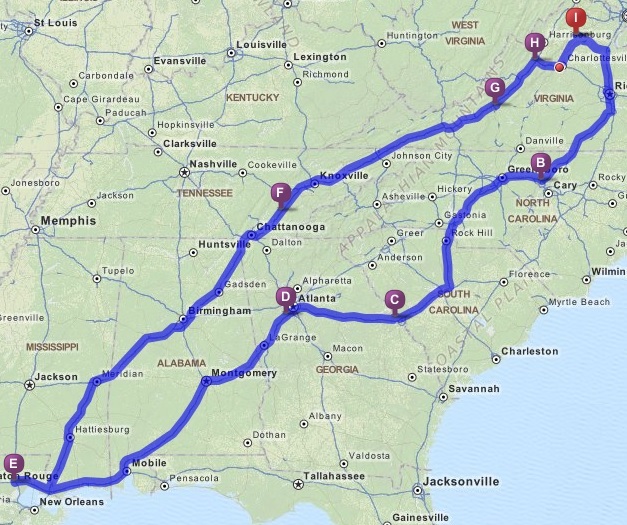 The first phase of this trip was to Durham, North Carolina. 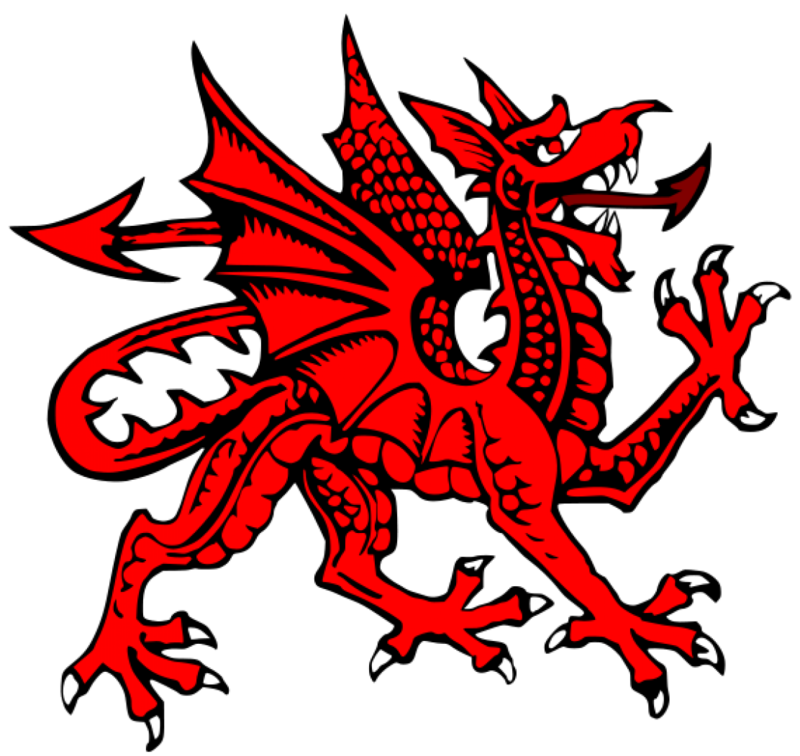 I have an uncle and aunt who live there, and I haven’t seen them in several years. We used this opportunity for a quick visit. As a bonus, one of their two sons was home this Christmas. This was the first time any of them met Caitlin or Michael in person. We spent the night in a rather nice hotel a short drive from their house. 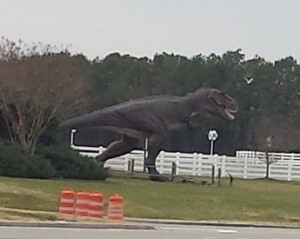 Tyrannosaurus Rex statue, Doswell, Virginia. We left Durham around 9:00am, for our next stop of Evans, Georgia. Lisa has an aunt, uncle, and cousins who live there that she hasn’t seen for many years. This was another case of opportunity knocking, so we paid them a visit. We spent a few hours with them, and had dinner at a local restaurant, and generally had a good time. Caitlin was especially happy to have people close to her own age that she could hang with for a while. After this visit, we traveled an additional two hours to a suburb of Atlanta, where we had hotel reservations for the night. This particular piece of travel was very difficult, because it was pitch dark and raining most of the way. Still, we made it to our hotel just after midnight, and quickly crashed. This hotel was quite a contrast to the one we had in Durham, but we were too tired to care. 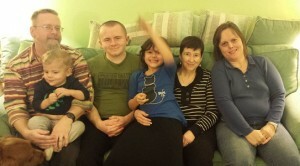 Uncle Conrad, Caitlin, Chloe, Michael, Aubry, Aaron, and Aunt Pat. 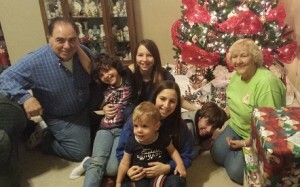 Aunt Pat, Uncle Conrad, Aubry (being a goofball), Donald, Connie, Chloe, and Aaron. 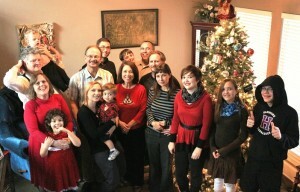 Aunt Pat, Precious, Uncle Conrad, Lisa, Michael, Connie, Aubry, Caitlin, Chloe, Aaron, and me. We got a later start than we had planned, because after the previous night we decided that the extra sleep was a necessity. 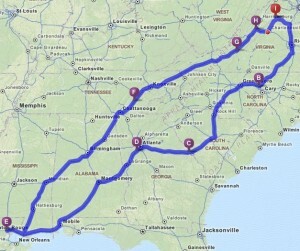 We left the Atlanta area around 10:00am (Eastern Time), and made a bee-line toward Louisiana. Fortunately, traffic was light and the weather was co-operative. We opted to spend the night in Atlanta so that the Atlanta rush hour traffic would all be behind us when we continued. Given the congestion on the other runner, this was a smart move on our part. 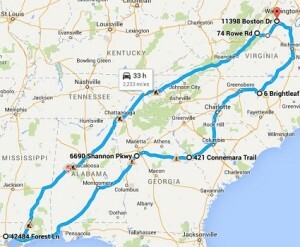 The trip through Alabama, Mississippi and Louisiana was smooth and without incident. Well, it was without incident if you discount Michael’s little adventure in the restaurant where we stopped for lunch. Catching a toddler that doesn’t want to be caught can be quite a challenge! We reached Hammond, Louisiana, around 6:00pm (Central Time). The three day outbound drive was now complete. 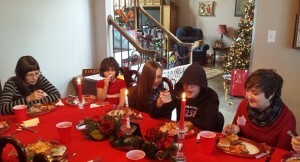 Christmas Eve included a traditional Lithuanian Christmas Eve dinner at the Vedeckis home. Sadly, it also included the loss of one of Michael’s special shoes during a last minute gift acquisition run, which was itself a complete and total failure. 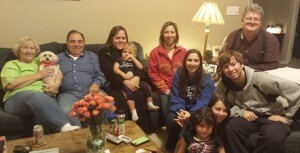 A large gathering of Lisa’s extended family filled the Vedeckis house for several hours. 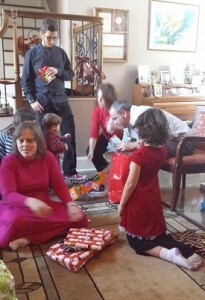 Presents were opened, photographs and news were shared, and lots of food was consumed. It was one heck of a party! 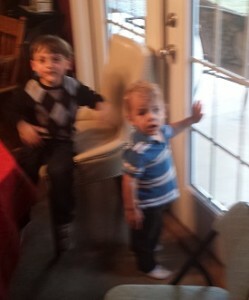 This was another low key day, though we were able to replace Michael’s missing shoes. The plan was to visit one of Lisa’s sisters, and allow our various children to play. However, this did not happen. In mid-afternoon I learned that I had to return to Northern Virginia. We hastily packed and disembarked. None of the additional visits to family in Hammond took place, not did any intended visits to New Orleans or the surrounding area. Unfortunately, this is how life goes sometimes. No matter how well plans are laid or preparations made, if Fate and/or the Almighty has something else in mind, then the gig is up. We drove straight through the night, and through one of the worst rainstorms I have ever experienced. We had originally planned to stop for the night at some point, but I wasn’t willing to wait. In this particular case, time was far too precious. We arrived home on the afternoon of December 28. We were able to make a quick stop at Mrs. Rowe’s restaurant in Stanuton, Virginia. However, we didn’t have a meal, which was the original plan. We picked up some frozen take-home food, and moved on. Still, the restaurant was busy, and the smell of Americana food was strong and enticing. I was pleased to see that this local restaurant was still going strong. 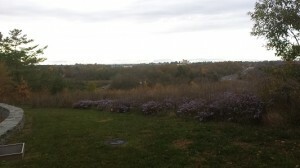 It was an overcast and dreary day in North Central Virginia. This brought Operation Arapaima to an abrupt, premature, and sombre conclusion. The next major family trip will be next summer, to the Chicago area. Caitlin and I have already code named this trip “Operation Bullfrog.” Hopefully it will be more successful. Christmas of 2014 was a break from tradition, in that we chose to travel. The reasons for this massive road trip are described in another article, but Christmas of 2014 will be spent in Hammond, Louisiana. 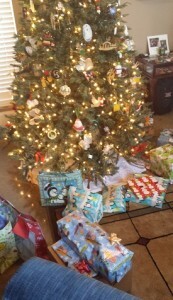 Typically we spend Christmas day partly at home, and partly in Maryland, where my brother lives. In recent years we have spent time with Lisa’s family during the summer months, but this particular year that didn’t happen. So this time around, we spent Christmas with Lisa’s family. Her parents live in Hammond, while her two sisters and their families live in the surrounding area. The Vedeckis home in Hammond will be hosting a large family gathering worthy of Norman Rockwell. My father-in-law is largely Lithuanian in extraction, and for many Christmases he sets up a traditional Lithuanian-style Christmas Eve dinner. I’ve been to two of these in the past, and they were both great. I suspect this one will be no exception. For my part, I brought some Virginia red wine to go with this dinner. I hope it goes with the entree. 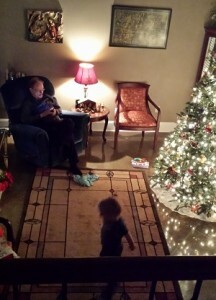 My father-in-law and son at the Christmas tree. Front Row: Caitlin Pugh, Nicholas Farley. Middle Row: Lisa Pugh, Kathy Farley, Mary Vedeckis, Michelle Bardwell, Zoe Bardwell, Mya Bardwell, Fox Bardwell. Back Row: Richard Pugh, Michael Pugh, Wayne Vedeckis, Ian Bardwell, Gabriel Farley, Gregg Farley, Darren Bardwell. 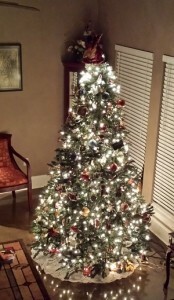 Christmas of 2015 may be a totally different story. We took surprisingly few photographs this year. Probably because we spent most of our time actually talking to one another, rather than pressing buttons on electronic gadgets. (Shock! Horror!) But still, we got a few. 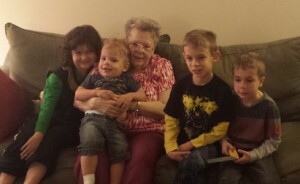 This photo shows my mom with her four grandchildren (from left to right): Caitlin, Michael, Connor, and Will. 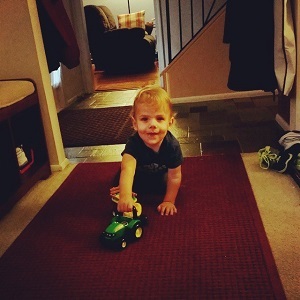 My brother, James, managed to get this cute image of Michael playing with one of his birthday presents. Things with wheels, and things with buttons are his favorites. This particular toy has both! 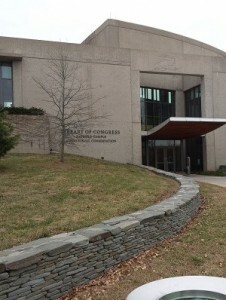 I work for the National Audio-Visual Conservation Center of the Library of Congress, located just outside of Culpeper, Virginia. The building is a converted Cold-war federal reserve bunker located on – and in – the side of a mountain. This building was selected for the underground storage rooms, which could be easily converted into climate controlled vaults for the storage of nitrate movie film, and other sensitive storage media. Besides being an interesting building, and an interesting place to work, it offers some unique visuals of the Piedmont region of Virginia. 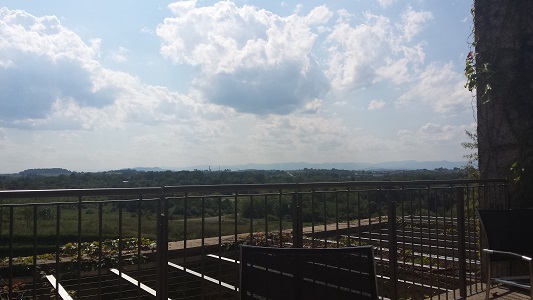 This image was taken on August 14 of 2014, from the cafeteria veranda. From here it is possible to see for several miles, especially on a clear day. The mountains in the background are part of the Blue Ridge Chain. The famous Blue Ridge Parkway snakes through those very mountains. 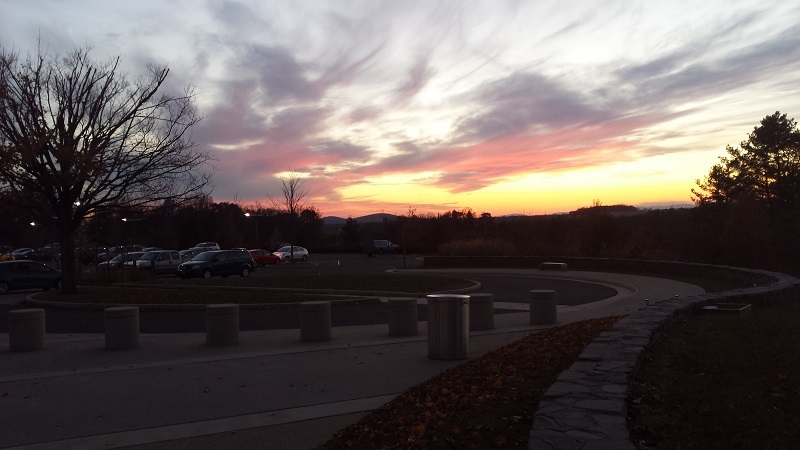 This one was taken from just outside the main entrance, on October 29, 2014. The interesting light greatly accented the wildflowers. This one, however, taken from the same location but with a different angle on the camera, brings out the strange weather pattern that had been visiting the area. 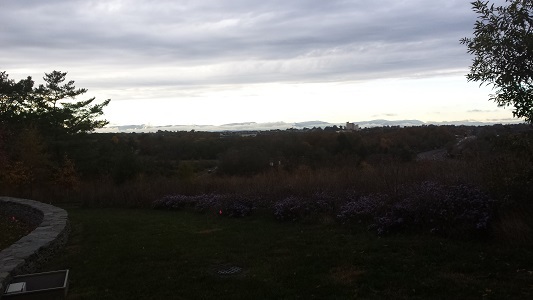 If you look into the valley, you will see a full cloud system settled right on top of the town of Culpeper. The driving was very strange that day, given that the town was fully engulfed in fog. 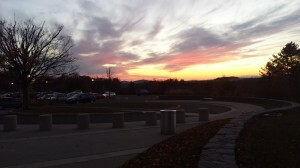 Finally, there is this impressive sunset, taken from the parking lot on the south side of the building. 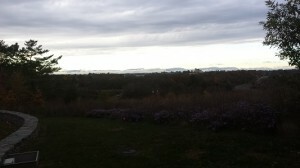 It was taken on November 19 of 2014, and it was bitter cold out. In truth, the cold may account for why the colors were so brilliant.